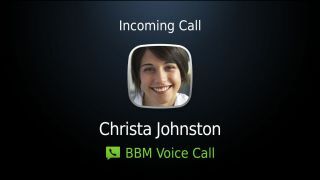 BlackBerry owners are now able to voice chat with each other for free over BlackBerry Messenger. The new feature, included in the BBM 7 update for the popular service, allows users to talk free-of-charge provided they are connected to a Wi-Fi network. This addition will be welcomed by those with top-up phones and the frugal alike, as well as those travelling abroad and those who live in far-flung corners of the country where network signal is lacking. A 'split-screen' functionality has been integrated into the service to allow BBMers to switch between text and voice chat at will, or use both together simultaneously. Handy when sending pictures…and perhaps in situations where there's more to tell than you can let on over the phone. BBM 7 also allows BlackBerry owners to use other functions of their device while in voice chat, such as reading texts and emails and navigating through apps. Another crucial feature in BBM 7 is BlackBerry ID, which backs up users' BBM profiles, groups and contacts. This information is automatically restored when a new BlackBerry device is activated, allowing for hassle-free phone-switching.